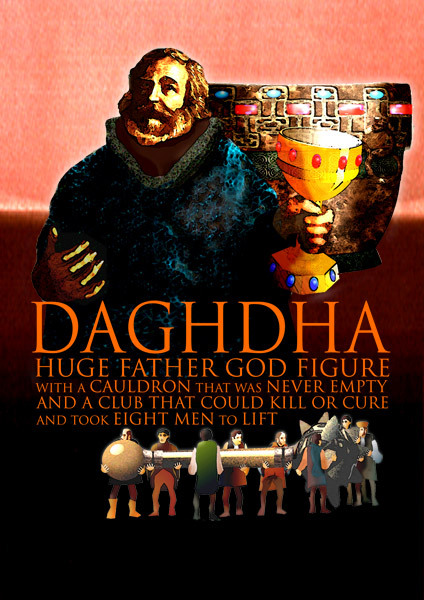 Daghda was chief amongst the Gaelic gods and was therefore an equivalent to the king of the Greek gods, Zeus. Daghda’s name means the “good god”, not in the moral sense but meaning good at everything. One of the main differences was that the Irish gods were not worshipped or sacrificed to, but instead they were characters of an oral poetic tradition. Daghda was a mystical supernatural being with magical powers, and his strength derived from his knowledge of the hidden, which in folklore was the highest kind of wisdom. Daghda was especially connected to two particular implements. The first was the large bronze cauldron from which it was said he ate his porridge. Another version of this was that he ate it from a huge hole in the ground. The second was the club with which he armed himself. Its enormous size meant that it had to be transported on wheels. Daghda was a warrior god, taking part in many battles. His death occurred when he was killed by a female warrior called Caitleann who cast a sling shot at him and he died of the wound. Daghda was the warrior chief of the Gaelic gods and was a dominant, if not invulnerable, character. His power was further enhanced by his knowledge of hidden powers, a gift which set him above the ordinary gods.